2 pages ws where the students learn about hours, everyday activities. 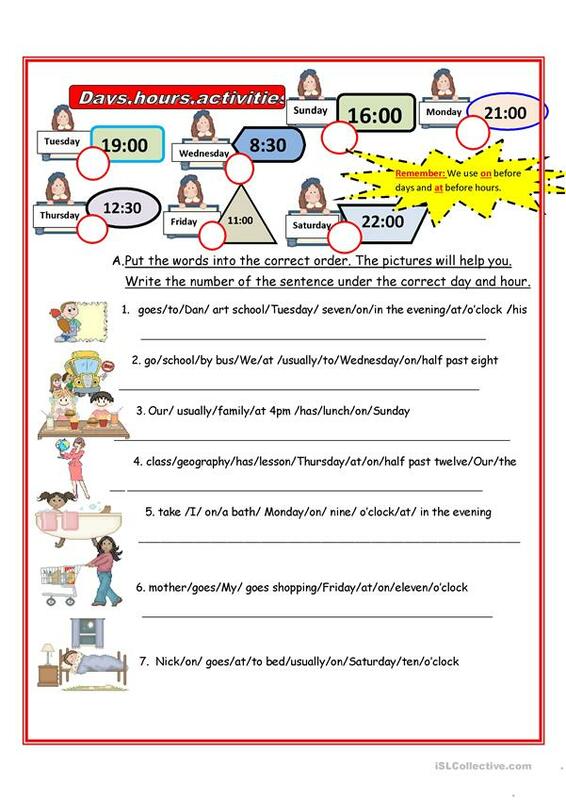 There are some exercises-words order in the sentence, complete the chart, answer the questions and write about their day. The above printable, downloadable handout is meant for elementary school students at Elementary (A1) and Pre-intermediate (A2) level. It is valuable for practising Present simple tense in English, and is a valuable material for working on your groups' Reading and Writing skills. It centers around the theme of Daily routines. ellakass is from/lives in Israel and has been a member of iSLCollective since 2011-04-21 12:24:51. ellakass last logged in on 2015-02-25 06:39:30, and has shared 38 resources on iSLCollective so far.